Romney looks like a slicked-up 50's poster child. He also talks a little like maybe he thinks that's what he is (and, correspondingly, that's how the world is today). Also, he's the flippiest-floppiest liberal-that-wants-to-be-conservative up there, except for maybe Giuliani. Heck, let's take care of Rudy while we're at it..
(Moderator) Knowing everything you know right now, was it a mistake for us to invade Iraq? (Romney) Well, the question is, kind of, a non sequitur, if you will. What I mean by that -- or a null set -- that is that if you're saying let's turn back the clock and Saddam Hussein had opening up his country to IAEA inspectors and they'd come in and they'd found that there were no weapons of mass destruction, had Saddam Hussein therefore not violated United Nations resolutions, we wouldn't be in the conflict we're in. But he didn't do those things, and we knew what we knew at the point we made the decision to get in. I supported the president's decision based on what we knew at that time. Huh? Professional politician there, unwilling to say "I was wrong." (John Edwards, by the way, is excellent at saying he was wrong. That wins big in my book under the "honesty" category.) But Romney's a math geenius, throwing references to null-sets and stuff out there. (Giuliani) Absolutely the right thing to do. (Romney) All over the world, we're seeing the same thing happening, and that is people are testing the United States of America. And we have to make sure they understand that we're not arrogant; we have resolve. And we have the strength to protect our interests and to protect people who love liberty. All over the world they're out to get us. Like in Australia, those crazy kangaroos are so anti-American. And Canada, they clearly hate us. (Romney) Well, first of all, Rudy Giuliani is right, in terms of an Apollo project to get us to energy independent. And the effects of that on global warming are positive. It's a no-regrets policy. It's a great idea. ..it's also not a free-market or conservative solution.. (he's also very liberal on health care). (Romney) Now we’re going to — you said the person’s going to be in Guantanamo. I’m glad they’re at Guantanamo. I don’t want them on our soil. I want them on Guantanamo, where they don’t get the access to lawyers they get when they’re on our soil. I don’t want them in our prisons. I want them there. Some people have said, we ought to close Guantanamo. My view is, we ought to double Guantanamo. We ought to make sure that the terrorists — (applause) — and there’s no question but that in a setting like that where you have a ticking bomb that the president of the United States — not the CIA interrogator, the president of the United States — has to make the call. And enhanced interrogation techniques have to be used — not torture but enhanced interrogation techniques, yes. 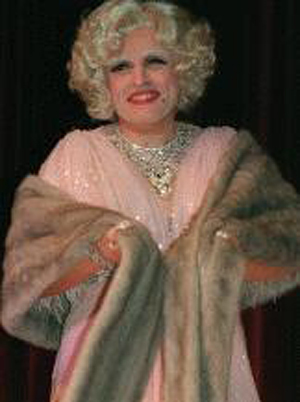 Here's Rudy Giuliani in drag. Doesn't the Republican party like to talk about family values? Looking for a little hope?